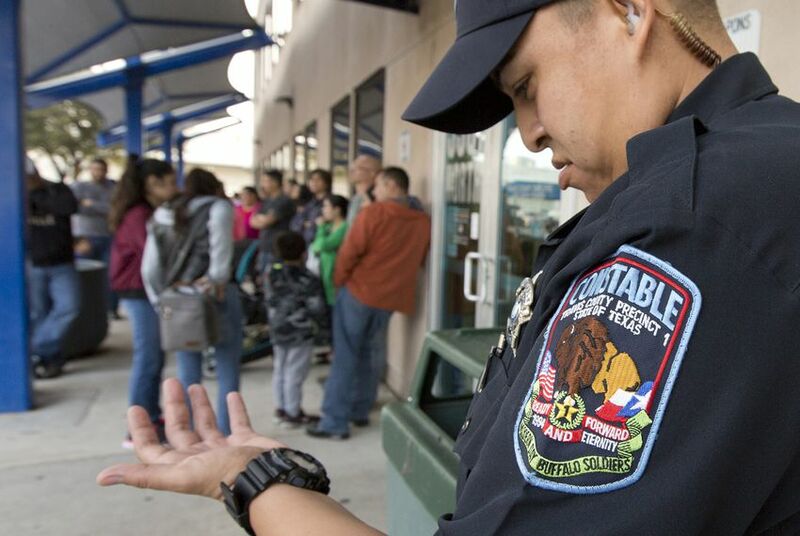 Fearing deportation, immigrant families are crowding passport lines across the state as undocumented parents seek U.S. passports for their American children. Carlos Bernal and his wife woke up their children, gathered their documents and drove to the Travis County passport office before dawn Monday. They were first in line at 5 a.m., three hours before the office opened. “We’re here to get our kids passports, in case they kick us out,” Bernal said in his native Spanish. His children, ages 14, 13 and 6, are U.S. citizens. He and his wife are not. Because of recent Immigration and Customs Enforcement raids, he said, they have to be ready to pack up and leave the country for Mexico. A recent flurry of ICE apprehensions around the country has sent undocumented immigrants from various countries running to passport offices and their native countries' consulates for documentation they pray they won't need. At the Salvadoran consulate in Dallas, Consul General Jose Mario Mejía Barrera said his office has seen a 25 percent increase in passport applications and child registries in the past month. Mejía Barrera's consulate serves around 150,000 Salvadorans who live in North Texas, Oklahoma and Arkansas. At the Mexican consulate in Austin, Consul General Carlos Gonzalez Gutiérrez said his office has seen an uptick in the number of applications for passports and birth certificates since the November presidential election. Last month’s ICE activity in Austin scared immigrants more, he said, because non-criminal immigrants were detained — a change from Obama-era policies. On Friday, Gonzalez Gutiérrez's consulate will hold its first-ever custody session to help undocumented Mexicans understand how guardianship works in case they have to leave their children with a documented family member or friend. Gonzalez Gutiérrez said immigrants also ask the consulate about property rights, wondering if the U.S. government can confiscate their homes. Two weeks ago, ICE arrested dozens of undocumented immigrants across the nation in what they said was a routine action. But the immigrant community was already on edge because of rising anti-immigrant rhetoric during the presidential campaign, and the ICE actions sent many undocumented families into a panic. 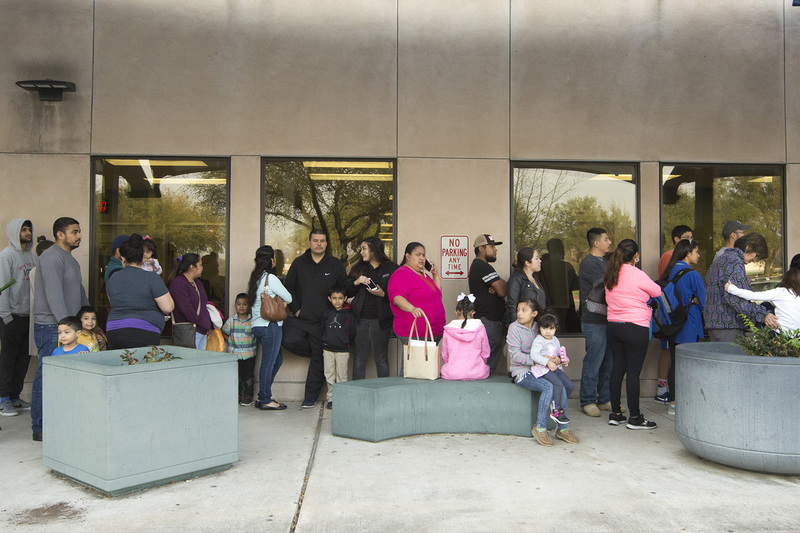 Behind the Bernals at the Austin passport office, the majority of the line was made up of immigrant families clutching their children's birth certificates; they waited several hours before being allowed inside the passport center. For some families, this was the first of two passport lines they had to navigate to ensure their children are correctly documented. Romina, a Mexican woman who has lived in Austin for 10 years, said she was going to get Mexican passports for her U.S.-born children after they secured their American passports. This is part of her emergency plan, she said, in case she or her husband are deported. Because she's an undocumented immigrant, she asked to be identified only by her first name. Nancy Howell, manager of Travis County's passport program, said her office normally serves slightly more than 100 applicants a day. In the past couple of weeks, however, they’ve been serving more than 200, with most lining up outside early in the morning. Most days, she said, her office has to tell some families to come back the next day when the office closes. On average, she said, it takes between 15 and 30 minutes to serve each family. The office has five to six staffers, but only two are fluent Spanish speakers. Howell said it is the customer’s responsibility to bring a translator. “We could probably do more if we had more clerks," she said. Outside, Anallely Aviles observed her kids, 6 and 4, running around, weary from waiting. Young children are as scared as the adults about the increased deportations, she said. A week after immigration agents launched surprise raids in Austin and surrounding areas, hundreds marched downtown in protest, saying fear has engulfed the Central Texas immigrant community. Undocumented immigrant Miguel Angel Torres was on his way to deliver Valentine's Day chocolates to his daughter last week near Austin. In what his family calls a case of mistaken identity, Torres was detained by Immigration and Customs Enforcement agents.